As the second instalment in our mini-series on Directional Protection, Directional Earth Fault Protection is, in our experience, the second most common form of directional protection deployed in distribution networks, but also provides an added degree of complexity for implementation. 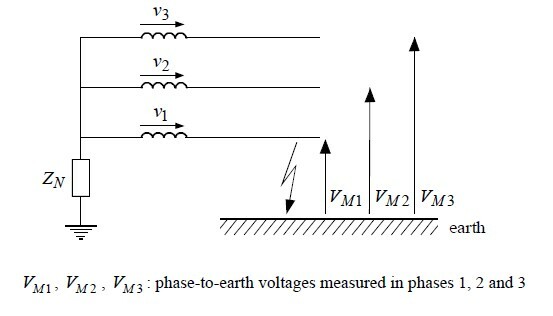 While Directional Earth Fault also uses the concept of a Relay Characteristic Angle to determine direction, it looks at a different vector value to conventional overcurrent: The Zero Sequence Component. In this article, we explain some of the concepts behind directional Earth Fault, sharing our experience to support field deployment of this valuable protection element. For those who missed our first article, distributed Generation around the world is an emerging technological trend, which poses a new set of challenges for the energy industry. With the real possibility of bi-directional power flow and the erosion of the conventional Generation, Transmission, Distribution, Retail sequence, the inevitable outcome is that distribution networks need to handle network protection in both a forward and reverse power flow scenario. The key to understanding Directional Earth Fault is to visualise and understand the fault current path, so that protection selectivity can be set appropriately. That is, we trip only on the faults we want to, and set up other circuit breakers to cover the other fault scenarios. We want to avoid “spurious tripping” (tripping when we aren’t supposed to), but must avoid failing to trip on a genuine fault. Earth faults occur when there is an undesired loss of energy out of the distribution system. A few examples include trees brushing up against powerlines, broken powerlines landing on the ground, or contact with other items or personnel at earth potential. These Single Line to Ground Faults or Double Line to Ground faults can be very serious, as they may involve life coming into contact with powerlines. When Earth Faults occur, a new “circuit” is completed as the foreign interference creates an earth path. This results in an imbalance in the currents and voltages, and current flows out through the earth fault site, and returns at other points in the network. This is not the same as an overcurrent fault, because overcurrent assumes that only the existing circuit lines (powerlines) are involved, with no energy leaving the system. In figure one, a simple Resistance Earthed Network is shown, where a single line to earth fault occurs on a feeder. When drawing the fault circuit, the resistive current flows out through the fault site, then returns through the star point of the upstream transformer. In a resistance earthed or solidly earthed network, this will be the largest component of the fault current is this resistive component. This is a common reason for DEF: How do you distinguish between a genuine downstream earth fault and a reverse capacitive current effect. These reverse capacitive currents are sometimes called “sympathetic” currents, as they are caused by faults on other feeders but still show up as an earth fault on the un-faulted lines. The current path for this can be seen in figure 1, where all the other feeders return capacitive current in the reverse direction. Like Overcurrent, earth fault protection uses a voltage vector as a reference for angle calculation, except DEF uses the Zero Sequence voltage and angle instead of the positive sequence. 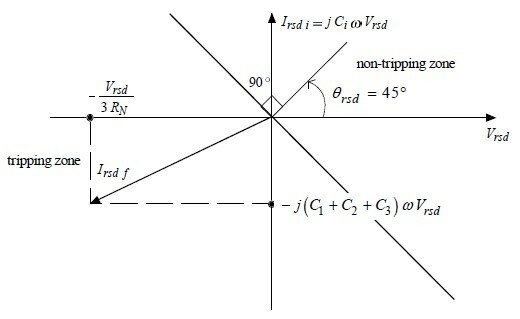 Figure 2 shows a simple calculation with a resistive earth on how this is reached. It is interesting to note that the Zero Sequence voltage angle is 180 degrees out of phase (is a negative value) with the normal condition positive sequence. It is important to understand if the relay in use requires this 180 degree shift. With this Zero Sequence Voltage vector calculated, all that remains is to calculate the Resistive and Reactive (usually capacitive) fault current. Therefore, the RCA (Relay Characteristic Angle) and tripping zone is likely to be similar to Figure 3, with minimal variation away from a resistive earth fault current being determined as “Forward”. In Figure 4, we see an unearthed network. Since there is no apparent resistive earth path, this implies that single line to ground faults tend to have low magnitude, but it certainly doesn’t mean that the lines are safe to touch. In an ungrounded network, the fault current is only capacitive, which means that directional earth fault protection must distinguish between the sign of the reactive component. I.E., is the capacitive current flowing forward or reverse? Modern techniques today include active compensation, devices which deliberately measure and inject compensation of energy to balance the fault and bring the current at the fault site to very low levels. Whilst these are effective, they also reduce earth fault measurability for conventional devices and make protection more challenging. These typically require specialist calculation and are beyond the scope of this article1. 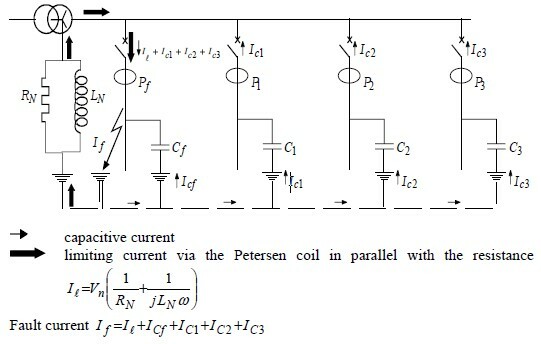 Nonetheless, figure 5 shows an example with a Petersen coil and a parallel resistor in the earth path of the transformer. The Neutral Earth Resistor (NER) allows a clamped resistive earth fault current, which gives protection devices a value on which to act. The earth fault principle is the same, as we sum the resistive and capacitive effects at the fault site, and all un-faulted feeders will only see the capacitive effects proportional to their “X’ value. NOJA Power has a subset of functionality for handling Compensated Neutral Networks available in their OSM Recloser product. For more information, contact NOJA Power. Bender, D., Marx, S., ©2013 An Introduction to Symmetrical Components, System Modelling and Fault Calculation, Presented at 30th Annual Hands on Relay School, March 11- 15 2013. Washington State University, Pullman Washington.